Second-placed Sevilla maintained the pressure on La Liga leaders Real Madrid with a stirring comeback win at bottom side Osasuna. Sevilla twice fell behind before two late goals moved them back within a point of Zinedine Zidane's side, who still have a game in hand. 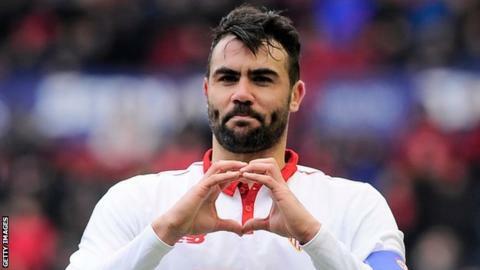 Sergio Leon put Osasuna ahead but Sevilla skipper Vicente Iborra levelled moments before the interval. Iborra then diverted into his own goal to restore the home side's lead after half-time, but made amends two minutes later when he pounced on a rebound to equalise again. Franco Vazquez's header put Sevilla ahead for the first time with 10 minutes left, substitute Pablo Sarabia sealing the win in stoppage-time. Osasuna did pull another goal back through Kenan Kodro, but Sevilla held out for their fourth away league win in five matches. Real Madrid moved clear of their nearest rivals by edging past mid-table Malaga on Saturday. Atletico Madrid's title challenge faded further with a 2-2 draw at Athletic Bilbao. Fourth-placed Atletico, aiming for a fourth straight win, fortuitously led when Koke's third-minute cross dropped into the net. Athletic levelled before the break through Inigo Lekue's thumping strike and Oscar de Marcos headed the home side in front before the hour mark. France forward Antoine Griezmann dinked in a wonderful equaliser from an acute angle with 10 minutes left, but the point leaves Atletico eight adrift of leaders Real Madrid. Match ends, Osasuna 3, Sevilla 4. Emmanuel Rivière (Osasuna) is shown the yellow card. Second Half ends, Osasuna 3, Sevilla 4. Goal! Osasuna 3, Sevilla 4. Kenan Kodro (Osasuna) header from the centre of the box to the bottom left corner. Assisted by Alex Berenguer with a cross. Goal! Osasuna 2, Sevilla 4. Pablo Sarabia (Sevilla) left footed shot from outside the box to the bottom right corner. Attempt missed. Kenan Kodro (Osasuna) right footed shot from outside the box misses to the right. Substitution, Sevilla. Joaquín Correa replaces Wissam Ben Yedder. Attempt saved. Alex Berenguer (Osasuna) left footed shot from the right side of the box is saved in the bottom right corner. Assisted by Roberto Torres. Substitution, Osasuna. Kenan Kodro replaces Fausto. Substitution, Sevilla. Matías Kranevitter replaces Franco Vázquez. Offside, Sevilla. Vicente Iborra tries a through ball, but Pablo Sarabia is caught offside. Goal! Osasuna 2, Sevilla 3. Franco Vázquez (Sevilla) header from very close range to the top left corner. Assisted by Pablo Sarabia with a cross following a corner. Corner, Sevilla. Conceded by Mario Fernández. Attempt saved. Adil Rami (Sevilla) header from the centre of the box is saved in the top centre of the goal. Assisted by Pablo Sarabia with a cross. Corner, Sevilla. Conceded by Oier. Substitution, Osasuna. Imanol García replaces Goran Causic. Substitution, Osasuna. Emmanuel Rivière replaces Sergio León. Hand ball by Stevan Jovetic (Sevilla). Attempt saved. Stevan Jovetic (Sevilla) right footed shot from outside the box is saved in the centre of the goal. Assisted by Wissam Ben Yedder. Foul by Alex Berenguer (Osasuna). Attempt missed. Wissam Ben Yedder (Sevilla) right footed shot from outside the box is too high. Assisted by Stevan Jovetic. Substitution, Sevilla. Pablo Sarabia replaces Gabriel Mercado. Goal! Osasuna 2, Sevilla 2. Vicente Iborra (Sevilla) header from the centre of the box to the centre of the goal. Attempt saved. Wissam Ben Yedder (Sevilla) left footed shot from the left side of the box is saved in the centre of the goal. Assisted by Stevan Jovetic. Offside, Osasuna. Goran Causic tries a through ball, but Sergio León is caught offside. Own Goal by Vicente Iborra, Sevilla. Osasuna 2, Sevilla 1.